little material dedicated to transceiver architecture and system design. Similarly, much of the existing literature looks at concepts useful for dimensioning, yet offers little practical information on how to proceed for dimensioning a line-up from scratch, and on the reasons for proceeding that way. 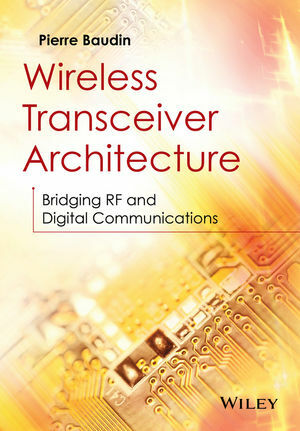 This book redresses the balance by explaining the architecture of transceivers and their dimensioning from the perspective of a RFIC architect from within industry. It bridges the gap between digital communication systems and radiofrequency integrated circuit design, covering wireless transceiver architecture and system design from both system level and circuit designer aspects. Pierre Baudin received his MSc degree in radiocommunications from the École Supérieure d’Électricité (Supélec) in 1994. He then served as a microwave R&D engineer working on electromagnetic stealth problems for the Commissariat à l’Énergie Atomique during military service. In 1995 he joined Thomson-CSF (now part of Thales) as an antenna designer working on antenna modeling, antenna array synthesis and signal processing for antenna arrays. In 2000 he joined STMicroelectronics, and then Renesas Electronics in 2007 (Renesas Mobile Corporation since 2010) to work as a RFIC and RF system architect in charge of multimode systems for cellular applications. He is now working as a consultant.